Gov. Peter Shumlin cited adding more jobs, property tax reform and affordable health care as his top priorities for the next biennium should he be elected to a third consecutive two-year term on Nov. 4. On school governance/consolidation, Shumlin does not support the notion of requiring schools to consolidate. Instead, his strategy during the coming months will be to give communities what he believes are sobering statistics showing that Vermont public schools will need to make some substantial structural changes if they are to remain financially viable. To that end, Vermont Education Secretary Rebecca Holcombe — in partnership with the Vermont School Boards Association — will meet with municipal and school officials to present information and candid feedback. That data, Shumlin said, will show what towns are currently spending and what property taxes are likely to look like in five to 10 years. Shumlin is aware of the growing hue and cry statewide about the property tax burden that many Vermonters face. But he said the state, at least in the short term, should focus on improving the state’s current education finance law (Act 68), rather than scrapping it for some new hypothetical system. “I would caution voters to be wary of promises for a new system that no one has a plan for,” Shumlin said, noting the approaching general election. “As frustrated as we are with school spending and property taxes, when you don’t have anyone walking around with a new funding formula that’s better than the one we have, be suspicious of promises of things that don’t exist… I think that if there were a simple solution to this, someone would have figured it out by now,” he added. 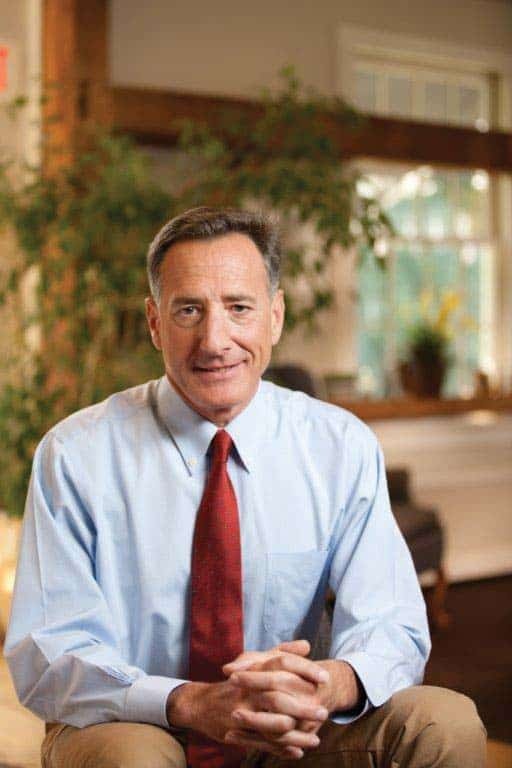 Asked to name his biggest disappointments since taking office four years ago, Shumlin cited the failed roll-out of the Vermont Health Connect website. That site — which allows people to register for insurance through a federally mandated health care exchange — has been temporarily deactivated. One important economic advantage Vermont has, he said, is its unrivaled quality of life — specifically citing the state’s great schools, strong communities and natural beauty. “Vermont is also leading in a number of emerging economic areas, seizing opportunities to create jobs,” he said. “Vermont is charting a renewable energy future that is attracting entrepreneurs, companies and jobs. In 2013 alone, Vermont created 1,000 solar jobs, the highest growth rate in America. “When it comes to technology, Vermont is making a big name for itself despite its small size. Burlington, already home to many great technology companies, has been rated one of the top 10 emerging tech hubs in the country. He also said agriculture would continue to be a big part of Vermont’s economic picture, touting Vermont beer, cheese and other value-added products. “The Vermont-made label is sought after and respected worldwide,” he said. Vermont’s small size is also a big advantage, he said. “Businesses large and small have access to all levels of state government in a way that is unheard of in other states,” he added. John Flowers is a reporter for the Addison Independent, as sister paper to The Mountain Times. It’s very telling Mr. Shumlin cautions against revising education funding, and even more telling he rationalizes the ridiculous increase in education spending while enrollment has gone down as simply expense increases. What this tells me he is paying lip service to people’s concerns regarding the unsustainable property tax burden education funding has created and is not going to really do anything about it. But even more telling is non-acknowledgement of his single payer health insurance proposal. He has fought every request for information as to how it is going to be funded. Yet no mention is made of single payer in this article’s stumping for office. I suppose that is with good reason as it’s a very expensive proposition, which coupled with Vermonters’ disenchantment with Act 60/68, would threaten his re-election hopes because of the increased tax burden single payer will engender. I’m sure if he’s re-elected the single payer funding proposal will be public shortly thereafter.